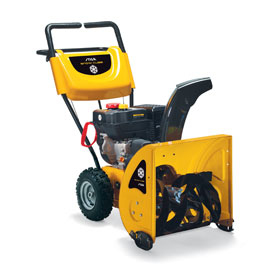 The Stiga Snow Cube Blower is suitable for heavy duty domestic use. This two stage snow blower has a toothed auger and is ideal for homes with longer driveways to clear. It has a 56cm working width and is powered by a recoil start Stiga 212cc petrol engine. The adjustable discharge chute deposits the snow just where you want it. A single hand grip and adjustable skid shoes (no bending required) are standard features.